Our charm bracelet competition is now closed – well done to our winner Sue Horne. 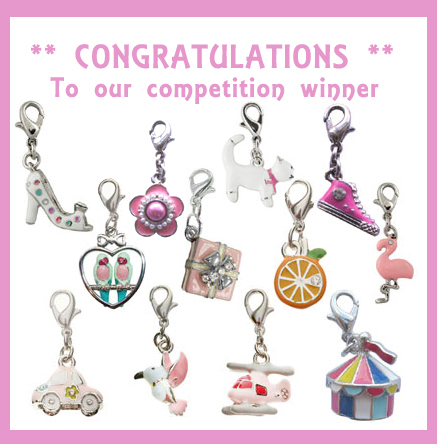 Thank you to everybody who entered the Diamond Kids competition to win a gorgeous children’s charm bracelet and congratulations to our winner Sue who will now be able to choose 10 gorgeous Bombay Duck charms to go on her bracelet. If you would like to create your own charm bracelet visit our website for a cute and colourful selection of children’s charms and a selection of bracelets. Each Bombay Duck charm is beautifully enamelled with careful design and detailing and many also featuring sparkly gems for added effect. With charms covering all sorts of girly hobbies and interests there is sure to be a charm or two to capture your heart, from shoes & bags, cakes & ice creams, cute animals and fairytale themes.